Tuesday, April 30, 12-4pm Barnes & Noble, Manhattan Gateway Shopping Center, 1800 Rosecrans Avenue Building B,Manhattan Beach, CA. Monday, Jan. 14, 2013, Bluestockings Books, 172 Allen Street, Manhattan, NY. OFFICIAL RELEASE event in New York, for the 3rd Edition. STUPENDOUS AUTHOR EVENT: Organized and promoted by publicist Ernest Jackson and Frank Romano. Many people showed up, Muslims, Jews, Christians and people of other faiths, for the talk followed by a discussion on Middle East peace through grassroots efforts and the book “Love and Terror in the Middle East, 3rd Edition.” The quality of the event was greatly enhanced by Eduardo Simmonds (Photos), Charity Lynette (Great Interview) & Terrell Blair of BOOKBANDITZ.COM. 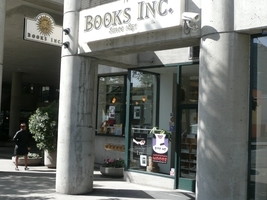 Thursday, Jan. 10, 2013, Books Inc. Opera Plaza, 601 Van Ness Ave., San Francisco, CA. OFFICIAL RELEASE event in California for the 3rd Edition. Here I’m standing with Paula Kasparian, Olivier Sayyada, Ibrahim Ahmad Abu El-Hawa and others of “Artisans de Paix,” following a beautifully inspiring mass at the Benedictine monastery in Abu-Gosh, Jerusalem. I was invited to lunch by Olivier Sayyada of “Artisans de Paix,” an active interreligious group from France. To break bread with such a diverse, enlightened group was an unforgettable honor. 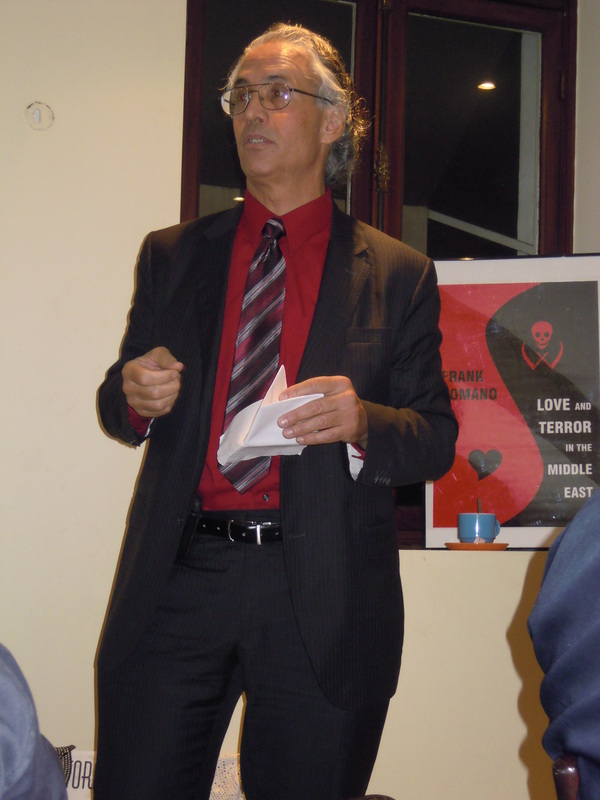 During lunch, I was invited to say a few words about my interfaith activities in Israel and Palestine, which are chronicled in my book “Love and Terror in the Middle East,” 3rd Edition. Sunday, Nov. 18, 2012, 7 pm, Yafa Café and Bookshop, Yehuda Marguza 33, Jaffa, Israel, OFFICIAL RELEASE event in ISRAEL for the 3rd Edition. 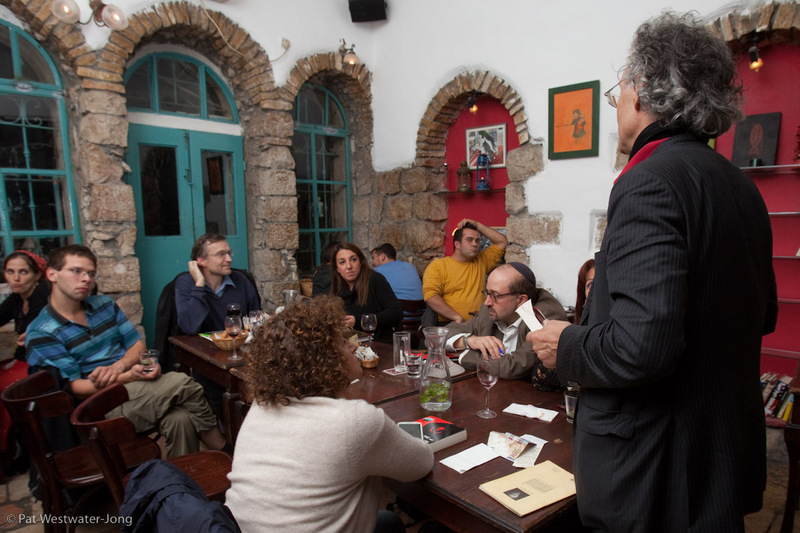 INCREDIBLE author event at Yafa Café and Bookshop, under the ROCKET attacks. 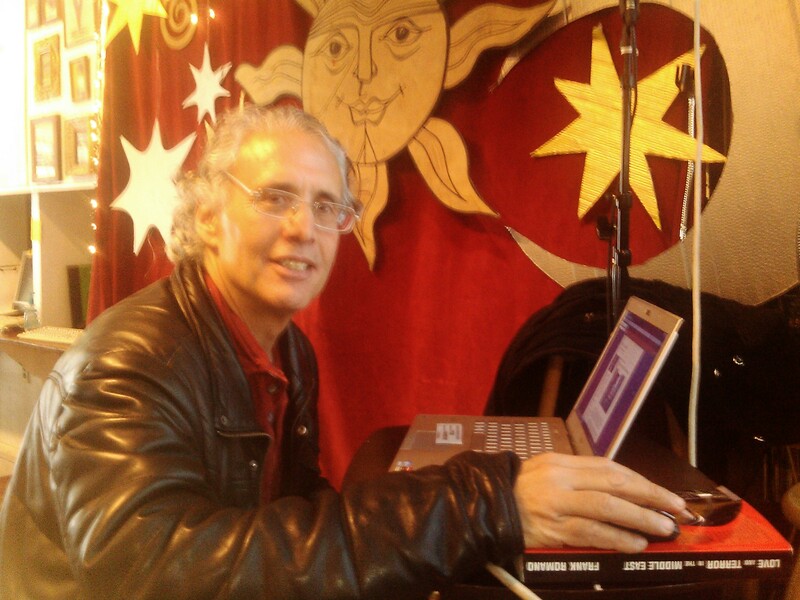 On Nov. 18, 2012, about half-way through my author event for “Love and Terror in the Middle East,” 3rd Edition, in Jaffa, Israel, the sirens wailed and we had to take shelter. Within minutes two loud explosions were heard; I was informed that they were rockets intercepted by the Israeli defense system. 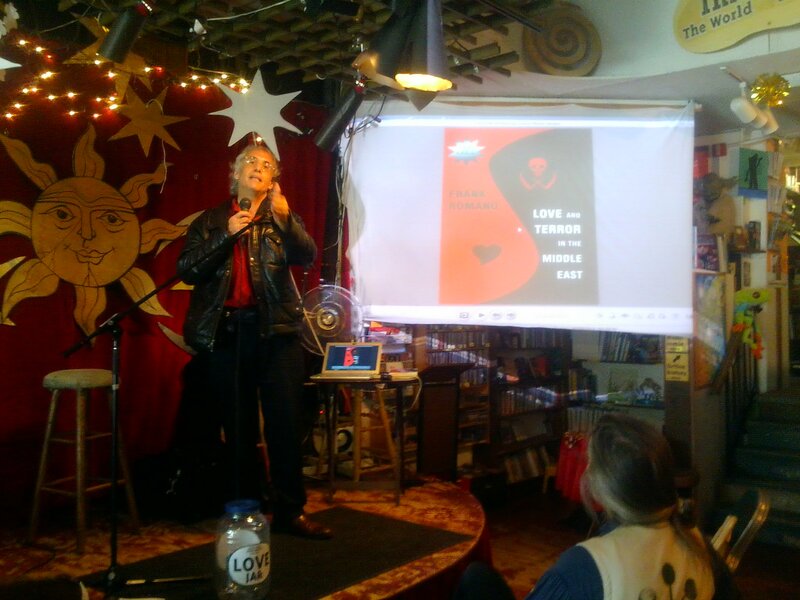 After the warning sirens were silenced we returned to the café for the event. . .a reminder of the urgency to keep the peace/freedom dialogues going (the subject of my book) and to reach out to the world to end this crazy war, to withdraw from this crazy occupation. As you can see, this was pure interfaith with Jews, Muslims and Christians. Help us to keep focused down the lighted cosmic path of unconditional, beautiful love. . .you and me brothers and sisters! Wednesday, Nov. 20, 2012, 7 pm, Tmol Shilshom Bookstore Café 5 Yoel Salomon St., Jerusalem. buried deep within the shrouds of his friend’s mysterious death. 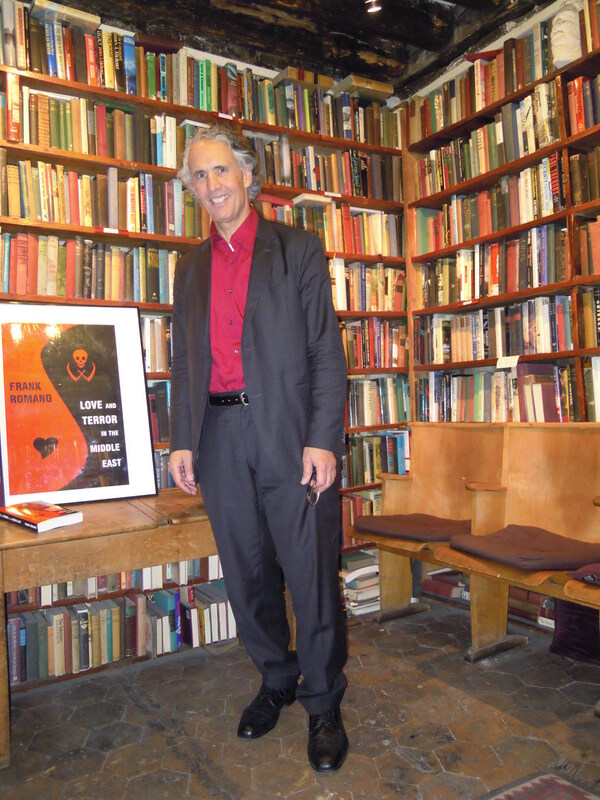 CA : EVENING with DR. FRANK ROMANO, sponsored by SRHS Foundation. the event of the following book: Love and Terror in the Middle East, 3rd Edition. 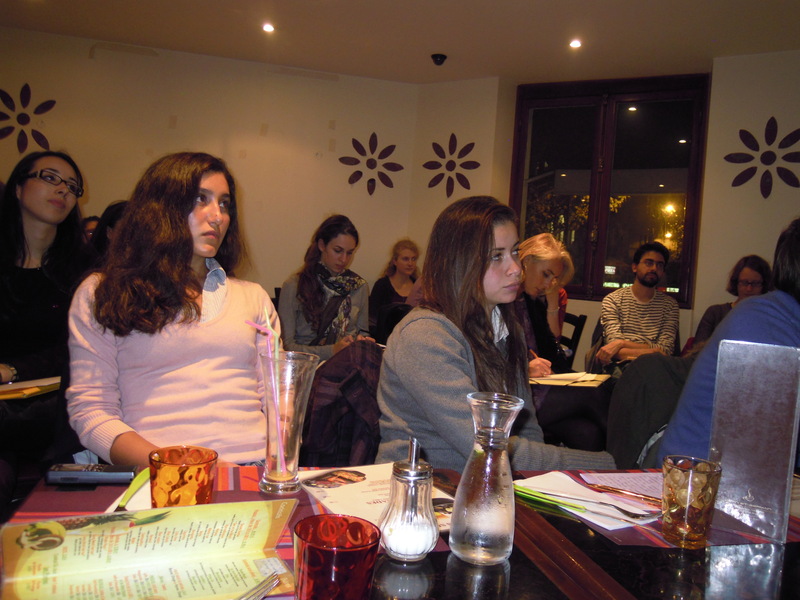 Monday, November 7th, 10:30-12/30, workshop, Shakespeare & Company, 37 rue de la Bûcherie, 5e Paris V (métro: St. Michel). A premier literary center in Paris. 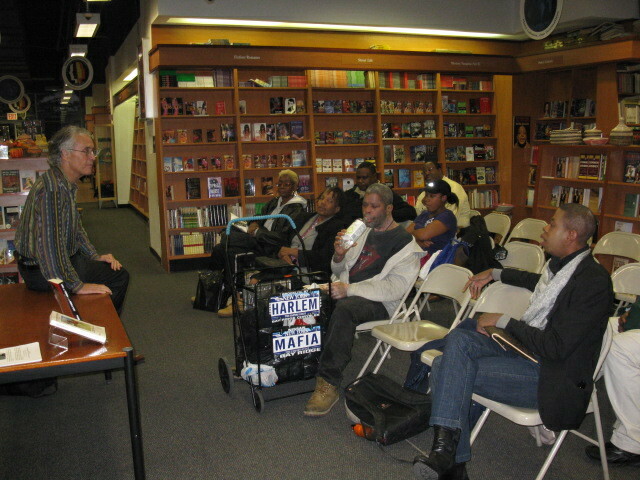 See photo below taken in the library of the bookstore before it filled to the brim for the event! !